The student's weekly agenda appears on the Portal Page of every parent and student. This agenda displays all assignments due and events scheduled for the week. 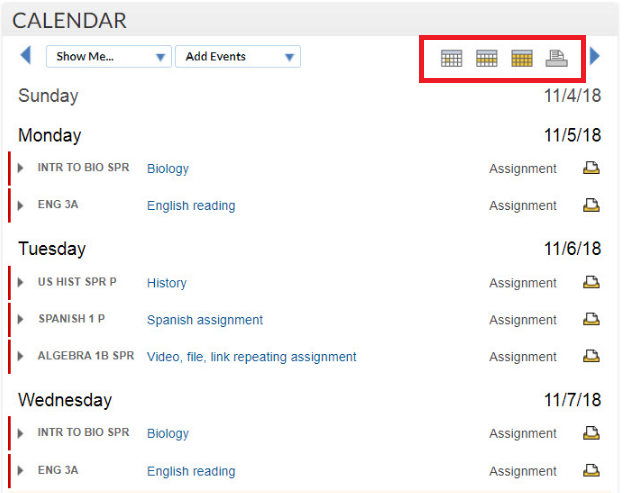 Notice that assignments and events are color coded. 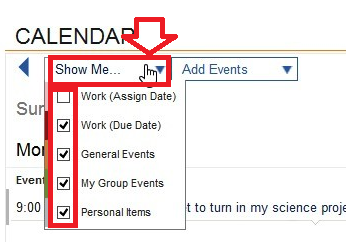 A legend is displayed on the drop-down menu under Show Me... Click the name of an assignment or event for complete details. From the details window you can discuss an assignment or submit work. To display either the month or day view of the agenda, click either the day or the month icon found at the top of the weekly agenda. To print the calendar, click the small printer icon. Scroll from week to week throughout the year by clicking the forward or back arrows. To view events found in your weekly agenda, click the Show Me menu at the top of the calendar, and use the checkboxes to show or hide the types of events displayed on your calendar. Note: This is not a permanent feature setting; it must be set each time you log in. 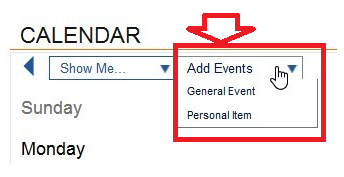 Students may add Events and Personal Items to their calendars by clicking Add Events, selecting either General Event or Personal Item and filling out the respective form. Note: A Personal Item will only be visible only to the student who entered it. General Events can only be added to pages the student has been given access to.